Copic Atyou Spica Pens...MY FAVORITE SCRAPBOOKING TOOLS! OK, everyone asks what is my favorite must-have tool for scrapbooking and without a DOUBT-both COPIC Spica Glitter Pen Sets. I'm all about BLING and ANYTHING that sparkles and use my Copic Spicas on almost EVERY project! 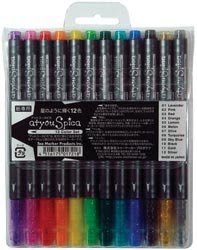 I think it should be mandatory that every scrapbooker and card maker own their own Copic Atyou Spica Pens! You can get both sets here at Scrapnesia Scrapbook Supplies and Invitations. Copic Atyou Spica 12 Color Pen Set A includes one each of Lavender, Pink, Red, Orange, Lemon, Melon, Olive, Turquoise, Sky Blue, Black, Gold and Silver. They are non- toxic, acid-free, transparent, pigement based and have a no-clog tip. Copic Atyou Spica 12 Color Pen Set B includes one each of Pitch Black, Garnet, Lipstick, Blossom, Chocolate, Sand, Peach, Buttermilk, Lilac, Baby Blue, Mint and Clear. They are non-toxic, acid-free, transparent, pigment based and have a no-clog tip. Each pen writes for over 360 yards! NOW....GO BUY THEM RIGHT NOW!!! Walk With Us at the 2009 Upstate South Carolina Arthritis Walk! The Arthritis Walk® is the Arthritis Foundation’s annual nationwide event that raises awareness and funds to fight arthritis, the nation’s most common cause of disability. It is a tremendous opportunity to help improve the lives of the 46 million men, women and children doctor-diagnosed with arthritis. Participants walk in honor of a friend or family member with arthritis. People with arthritis wear blue hats to signify their action in taking control of their condition. The event features a three-mile and one-mile course, with arthritis information and activities for the entire family. In many communities, pet owners are invited to bring their dogs along for the walk. Arthritis is a very difficult disease to manage, and even more so when you’re only 6 years old. We hope to raise awareness that arthritis is not just “an old person’s disease,” when approximately 300,000 children in the United States suffer from the often debilitating disease. So, together, our family is taking on the challenge to make a difference in Greenville, South Carolina by participating in the Arthritis Walk on October 25th at Cleveland Park in downtown Greenville. Here is the link to our Team’s page for the Arthritis Walk. Karissa is so excited to be the “team leader.” I am working on coming up w/a cute t-shirt design and a funky blue hat for her to wear. I’m thinking a blue tutu worn over leggings or denim w/a fun t-shirt will be perfect for her. Maybe use a boa trim around the hat or tiara. Sorry to digress--my daughter is a little diva in training and I love designing outfits for her. Use Your Memories to Help Find a Cure For Arthritis! 100% of the crop fees will be donated to the Arthritis Foundation through Karissa’s team. Round-Up your purchase through the month of October and donate your spare change to Arthritis research. Free pizza and lots of CHOCOLATE! Call Scrapnesia to reserve your spot today! (864) 288-7771! Please help support “Team Karissa” in any way you can. If you can’t donate financially, please join our team and walk with us! Please say you’ll join us! Our 6 ½ -year-old daughter Karissa was diagnosed with JRA (polyarticular) when she was about 2 ½ years old. Karissa’s arthritis symptoms appeared just after she started to walk. Sometimes she would drag her leg, or walk stiff-kneed like Frankenstein. I took her to doctors, (even videotaped her strange gait) yet after a whole battery of tests, we were told it was just growing pains. Being a new mother, I trusted the doctors and hoped it would pass. But her symptoms worsened until one day when she woke up from her nap and literally could not walk. She had to drag herself to a chair and she had a big red golf-ball sized knot above her knee. This was NOT growing pains! For some kids, diagnosis is agonizing because it’s often a case of determining what it ISN’T before you can determine what it IS. We went to doctor after doctor and refused to accept it was growing pains. And finally, after many more doctors and tests, she was finally diagnosed with Juvenile Rheumatoid Arthritis (JRA). We have to take her to Duke Children’s Hospital in North Carolina- 4 hours each way, because there are no pediatric rheumatologists in South Carolina. To look at Karissa, you would not know that she has this awful disease. She is a gorgeous little girl, who loves to sing, act, twirl and dance and adores anything that sparkles! But she’s also tough, and wants to be a super-hero--that’s my girl! However, Karissa has arthritis in both knees, both ankles, both wrists, most of her fingers and even some of her toes. It has been a long journey and we are fortunate that she’s doing well thanks to many prayers and her great doctors. Please visit our team web page and consider joining Team Karissa or making a donation to help us meet our goal. We hope to raise awareness and funds by walking so that one day there will be a cure for arthritis! And we need you on our team!